One step into Franklin Fountain and you suddenly feel transported back in time. This authentic ice cream parlor goes all out to capture the essence of the American dream. The decor is both classic and nostalgic, an easy reminder that “the good old days” really did exist. The servers, clad in all white suits and bow ties, add to the old-fashioned atmosphere as they scoop whopping mounds of homemade flavors (think rocky road, cookies and cream, and butter pecan) doused with the most delicious toppings also made in-house. It would seem un-American to stop in for a visit without getting the best homemade hot fudge sundae you’ve ever had, but we recommend going with the Mt. Vesuvius – “a mountain of chocolate or vanilla ice cream erupting in chocolate brownie boulders, cascading with hot fudge and blanketed in malt powder. A dollop of whipped cream indicates her smoking signal.” Drooling yet? An ice cream shop that doubles as a bar – need we say more?! As if the vintage atmosphere in this 1930s style soda fountain isn’t cool enough, The Ice Cream Bar concocts all of their soft drinks and ice creams in house and uses the best organic ingredients available. The ice cream flavors are unique and delicious such as banana puddin’ and crème fraîche, but what we’re really here for are the alcoholic fountain drinks. You really can’t go wrong with the Dublin Honey – a combination of Guinness stout, caramelized honey ice cream, Valrhona chocolate syrup, and a float of Graham’s 10 year tawny port. There’s a reason this little scoop shop has big lines out the door – they hit the nail on the head redefining everything you think you know about ice cream. The flavors are super unconventional, and we love that they use local ingredients as much as they can. Yes, the candy cap mushroom flavor might sound a bit strange, but we promise you this place is the real deal. Our favs include the strawberry honey balsamic with black pepper, sea salt with caramel ribbons, and the almond brittle with salted garnache. If you’re indecisive like us, go for the ice cream flight (your choice of five scoops to taste). P.S. Follow @saltandstraw on Instagram to stalk their adorable ice cream truck in the Los Angeles area. 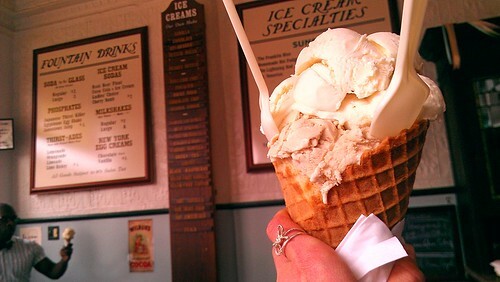 How can we not be obsessed with an ice cream shop that declares that “ice cream is cheaper than therapy”?! Waiting in the winding lines of beautiful people snapping photos to show off on Instagram is well worth it. This place is a blogger’s dream. We love the catchy phrases painted on the white brick walls and the fact that the Pasadena location is a re-purposed gas station. The most important thing to remember about Afters is that you must get the milky bun – creamy, melty, handcrafted ice cream sandwiched between a soft, gooey, hot donut. Yes, you even get to choose your own flavor and topping. Mix and match flavors such as strawberry cookie crunch, peanut butter s’mores, milk and cereal, and cookie butter with toppings like fruity pebbles, cookie crisps, and cinnamon toast crunch. Good thing we read the sign that cautioned us to leave our diets at the door. Images via The Odyssey, Flickr, Franklin Fountain, Jason In Hollywood, Spotted SF, Osmose Design, LA Times, Yahoo Style, Visit Pasadena and Salt & Straw.